‘ve conducted countless interviews, seen hundreds of movies, TV shows, documentaries, and read books about psychopaths. There’s only one series that makes Criminal Minds look like family fun. When you watch, your blood turns to ice, you check your doors and windows, and go to bed with the light on. If the voice doesn’t invade your sleep, or the images don’t give you nightmares, then maybe there’s a bit of psychopath in you? 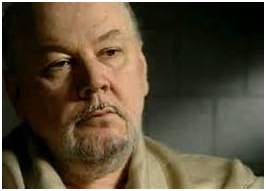 Richard Kuklinski, better known as “The Iceman” was a ruthless psychopath – pure evil. Born in Jersey City, N.J., he was the victim, along with his brother and sister, of severely abusive parents. By age 10, he tortured animals for fun. He committed his first murder at age 14. It didn’t take long to build a reputation as a tough street hustler who would beat or murder people he disliked. Eventually, he became a favored hit man for the mob – claiming to kill upwards of two hundred people. He was also married, had two children, and at 6’4 and 300 pounds, a very scary man to look at. Speaking in a monotone, The Iceman describes brutal murders that utilized his skills with cyanide poisoning, guns, strangulation, and knives – all while maintaining a “normal” family life. “One day I killed a guy at a red light. I used a sawed-off shot gun. It took off his head. He never saw the green light.” His lips twist into a crooked smile. He enjoyed using cyanide. In restaurants, The Iceman waited for his victim to take a bathroom break – dumping the poison on his plate. Or he would put cynanide in liquid form and bump into someone at a bar and spill it. The cyanide would soak through the clothes, the skin, and into the system – a sure kill. The Iceman even confessed to being part of a five-man team that kidnapped and murdered Jimmy Hoffa. On December 17, 1986, The Iceman was arrested, charged with five counts of murder, and sent to Trenton State Prison. While in prison, he was interviewed for three HBO specials. No props, no music, just the man – the psychiatrist – and the face of a true psychopath. He was far more chilling than any TV or movie drama. Even though he died at age 70, in 2006, The Iceman left his legacy. Watch these videos and . . . lock your doors.